About the time fall starts turning into winter, most people in the United States begin trading in their leaf-gathering rakes for snow-scooping shovels. 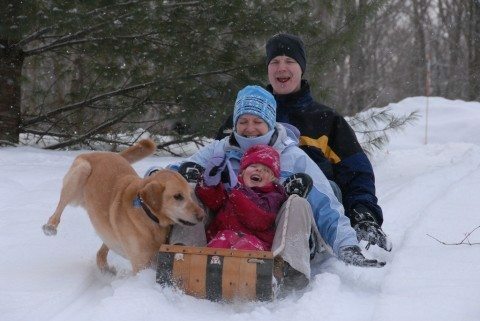 Yes, snow can be downright fun for some and complete misery for others. And, if you’re so inclined, you may even want to try a few tricks to make it snow just so you can catch a glimpse of the white stuff. You could try impressing your friends and family by telling them some of the snow facts listed below. Hey, it could make a great conversation starter when Jack Frost is nipping at your nose or you’re roasting chestnuts on an open fire! #1 – Each snowflake is unique – so, no two will ever look exactly alike. #2 – The typical snowflake has 180 billion water molecules in it. #3 – Permanent ice and snow cover 12% of Earth’s surface. #4 – For the first time ever, snow was reported on the ground of all 50 states on February 12, 2010. #5 – On January 19, 1977, a trace of snow was recorded in Homestead, FL (south of Miami) – that’s the furthest south snow has fallen in the continental United States. #6 – Afraid of snow? You may have chionophobia, which is the fear of snow. #7 – A blizzard is defined as the following: a snowstorm in which visibility drops to a ¼ mile or less, winds are 35 miles per hour or greater, and has a duration of at least 3 hours. #8 – Snowflakes fall at an average speed of 3.1 miles per hour. #9 – The snowiest city in the United States is Rochester, NY, where an average of 94 inches of snow falls each year. #10 – Snow forms at a temperature of 32 degrees Fahrenheit or lower. #11 – Snow is water vapor that has condensed without ever entering the liquid phase. #12 – Sleet, unlike snow, forms when rain drops or drizzle freeze into ice as they descend from a cloud. #13 – Snow is actually clear but appears white because of the way visible light waves from the sun are diffused in each flake. #14 – Cakes, cookies, and candies outsell all other types of food when a blizzard is approaching. #15 – All snowflakes have exactly 6 sides. #16 – The continental United States experiences an average of 105 snowstorms each year, with each event lasting between 2 and 5 days. #17 – The largest snowflake ever recorded fell in Fort Keogh, Montana in 1887. How large was the flake? 15 inches wide and 8 inches thick! #18 – The single-day record for snowfall in the United States is 63 inches – that’s how much of the white stuff fell in Georgetown, Colorado on December 12, 1913. #19 – A 24-hour snowfall record was made just 8 years later. On April 14 and 15, 1921, 75.8 inches fell in Silver Lake, Colorado. #20 – The year of 1816 is known as the year without a summer. Airborne debris from the eruption of the Tambora volcano, –along with effect of a little ice age — caused ice, frost, and snow in parts of the New England throughout the summer, spawning crop failures and causing many people to migrate to the Midwest.